Phenolic resins are the main binder used in the manufacture of different types of abrasive tools, including bonded, coated and non-woven abrasives. 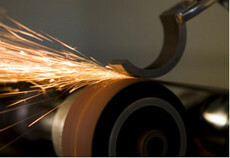 Bonded abrasives are shaped grinding tools such as grinding wheels, cutting and roughing wheels, segments etc. They consist mainly of abrasive grains (Al2O3, SiC, diamonds etc. ), fillers (cryolite, grinding aids etc.) and either an inorganic (vitrified abrasives) or organic binders. The majority of organic binders used are phenolic resins. Two types of phenolic resins are used in the manufacture of bonded abrasives. Firstly, the abrasive grains are coated with a liquid resol resin to ensure that the grains are perfectly wetted and completely coated to achieve a perfect bond. Secondly, a finely ground powder resin is mixed with the other powdered components of the abrasive mix and the wetted grains are poured into this premix. After final homogenisation, this mix is either hot or cold moulded into the desired shape and cured. Depending on the requirements of the grinding tool (e.g. soft, hard, flexible, tough) there are a range of standard and modified resins available on the market. Liquid resins are available in alkaline and neutralised media, with the neutralised version offering enhanced working life under cooling media. Powder resins are available with either very low or very high Hexa content (a resin crosslinking agent), or modified with epoxy resin or rubber in order to create a more elastic or tougher binding matrix. Coated Abrasives consist of a flexible backing substrate (e.g. paper, cotton or polyester cloth, vulcanized fibre) and conventionally a single layer of abrasive grain fixed using a binder on one surface of the backing. Coated abrasives can be bonded using organic binders such as animal glue, urea resin, epoxy resin, however phenolic resins are used predominately. These are generally water based resols. The manufacturing process is normally continuous, with the backing substrate being un-rolled to allow the reverse side to be printed and the topside to be coated with the make or base coat. The backing then passes through the grain coater where the grain is applied electrostatically, resulting in vertically oriented grains. This orientation ensures that the sharp cutting edges of the abrasive grit is directed towards the workpiece which provides a more aggressive cut. After the base coat is dried the backing passes through a second coater where the size coat is applied. This is necessary to fix the grains in their upright position. The resin is finally cured is a second, ‘festoon’ dryer. In the manufacture of non-woven abrasives a non-woven substrate, normally made from polyamide, is coated with a mix of abrasive grains, fillers and typically a phenolic resin binder. The resins used in this application are generally very reactive and low in free monomers. Coating is achieved mainly by spraying a mix of resin/grains and fillers on both sides and into the non-woven substrate. The resin is cured in horizontal ovens at much higher temperatures and for much shorter time than normal coated abrasives. The final, cured material is then cut and converted into sheets, cleaning sponges or belts for industrial or household applications. Phenolic binding agents provide remarkable adhesion to the abrasive grain and substrate with much lower sensitivity to moisture and higher thermal stability compared to alternative resin systems. In all kind of abrasive tools phenolic resins are the first choice binder as a result of their excellent price/performance relationship.